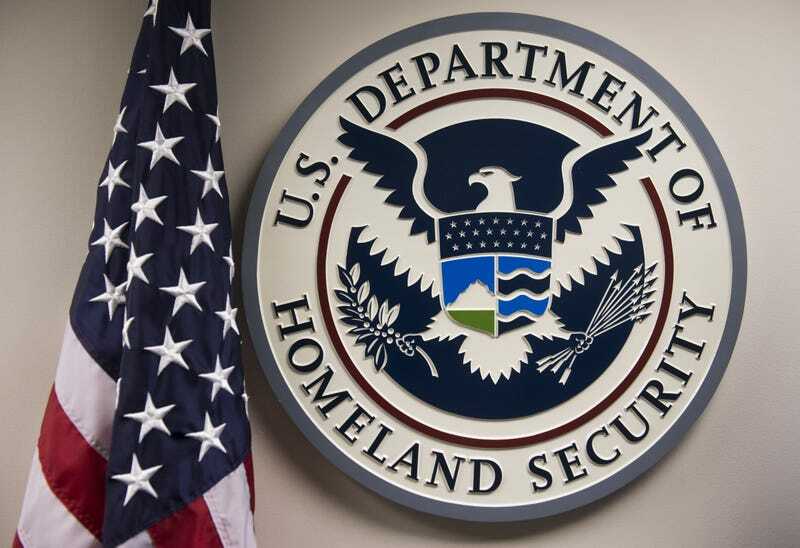 The logo of the U.S. Department of Homeland Security is seen at the National Cybersecurity and Communications Integration Center in Arlington, Va., on Jan. 13, 2015. In a move designed to spot potential terrorist threats, on Tuesday the U.S. government began asking foreign travelers to provide their Facebook, Twitter and other social media accounts upon entering the country, Politico reports. A government official confirmed Thursday that visitors arriving in the United States on the visa-waiver program are now presented with the “optional” request to enter information associated with their online presence. The question is included in the Electronic System for Travel Authorization, a process that allows citizens of 38 countries to travel and stay in the U.S. for up to 90 days without a visa. The prompt features a drop-down menu that lists platforms like Facebook, Twitter, Instagram and YouTube and provides a space for users to put their account names. According to Politico, the new policy comes as Washington tries to improve its ability to spot and deny entry to individuals who have ties to extremist groups like ISIS, also known as the Islamic State group, but the government has faced criticism since it first mentioned the idea last summer. Consumer advocates and the Internet Association, which represents companies like Facebook, Google and Twitter, have argued that the draft policy threatens free expression and poses privacy and security risks to foreigners. “There are very few rules about how that information is being collected, maintained [and] disseminated to other agencies, and there are no guidelines about limiting the government’s use of that information," said Michael W. Macleod-Ball, chief of staff for the American Civil Liberties Union’s Washington, D.C., office. "While the government certainly has a right to collect some information … it would be nice if they would focus on the privacy concerns some advocacy groups have long expressed." A spokeswoman for U.S. Customs and Border Protection, an agency of the Department of Homeland Security, told Politico on Thursday that the government approved the change Dec. 19, and the new policy is meant to “identify potential threats.” The agency had previously said that it would not deny entry to foreigners who did not provide social-media-account information. According to Politico, opponents of the policy worry that the U.S. change will prompt other countries to follow suit.